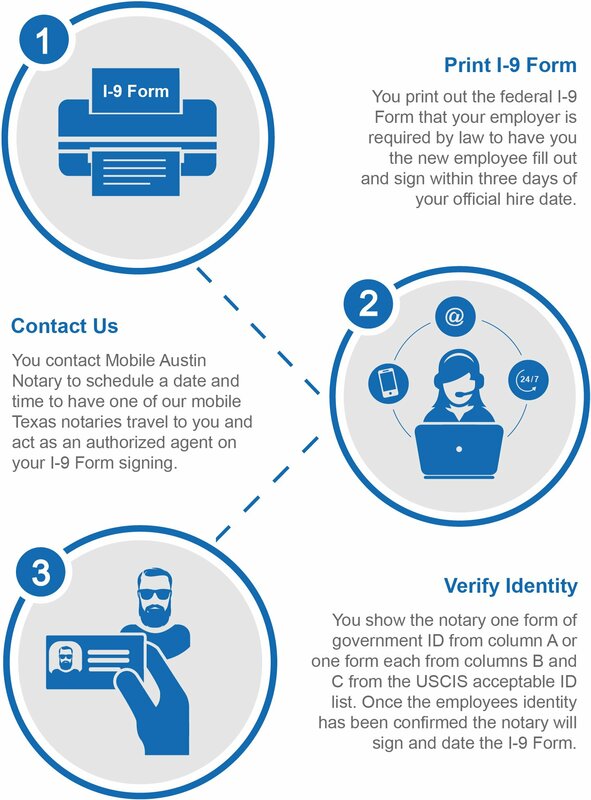 Mobile Austin Notary is a statewide 24 hour mobile legal and real estate services company based in Austin, TX that provides loan signing agent, mobile notary public, courier, I-9 Form authorized representative and employer agent remote employee verification services, same day Texas Secretary of State and rush federal United States Department of State document apostille and authentication filing, and U.S embassy, and consulate/consular document legalization filing services. A valid United States driver’s license issued from any of the fifty states. A valid passport issued by the U.S. Department of State. A valid United States Permanent Resident card (green card) issued by the U.S. Citizenship and Immigration Services (USCIS). A valid Texas Concealed Handgun License (CHL) or License to Carry Handgun (LTC) photo ID card issued by the Texas Department of Public Safety (DPS). A valid United States military uniformed services identification card or Common Access Privilege Card (CAC) which will be either a Geneva Conventions Identification Card or Identification and Privilege Card issued by the U.S Department of Defense. A valid state issued identification card issued from any of the fifty U.S states. *Any of the above listed acceptable government identifications to show a Texas notary public must be valid meaning the ID cannot be expired. "I AM NOT AN ATTORNEY LICENSED TO PRACTICE LAW IN TEXAS AND MAY NOT GIVE LEGAL ADVICE OR ACCEPT FEES FOR LEGAL ADVICE"
Zip codes and cities that we travel to 24 hours a day, including Saturdays, Sundays, and all major holidays. 73301, 73344, 78701, 78702, 78703, 78704, 78705, 78708, 78709, 78710, 78711, 78712, 78713, 78714, 78715, 78716, 78717, 78718, 78719, 78720, 78721, 78722, 78723, 78724, 78725, 78726, 78727, 78728, 78729, 78730, 78731, 78732, 78733, 78734, 78735, 78736, 78737, 78738, 78739, 78741, 78742, 78744, 78745, 78746, 78747, 78748, 78749, 78750, 78751, 78752, 78753, 78754, 78755, 78756, 78757, 78758, 78759, 78760, 78761, 78762, 78763, 78764, 78765, 78766, 78767, 78768, 78769, 78771, 78772, 78773, 78774, 78778, 78779, 78780, 78781, 78782, 78783, 78785, 78786, 78787, 78788, 78789, 78664, 78665, 78680, 78681, 78682, 78683, 78660, 78691, 78613, 78630, 78626, 78627, 78628, 78633, 78620, 78602, 78652, 78644, 78640, 78610, 78666, 78667, 78676, 78130, 78131, 78132, 78133, 78135, 78617, 78734, 78738, 78746, 78653, 78652, 76501, 76502, 76503, 76504, 76505, 76508, 78612, 78645, 76522, 78621, 76574, 77586, 77705, 78669, 78154, 78155. Downtown Austin, Pflugerville, Round Rock, Cedar Park, Georgetown, Lakeway, Manor, Killeen, Belton, Fort Hood, Bertram, Cedar Creek, Temple, Dallas, Dripping Springs, Blanco, Burnet, Johnson City, Hutto, Marble Falls, Lago Vista, Lake Travis, Copperas Cove, El Paso, Sealy, Rollingwood, Bee Cave, West Lake Hills, Del Valle, Lockhart, Bastrop, Elgin, Taylor, Rockdale, Hearne, Horseshoe Bay, Wimberley, Lost Creek, Jollyville, Anderson Mill, Brushy Creek, Jonestown, Briar Cliff, Dale, Manchaca, Plano, Arlington, Brenham, La Grange, Medina, Sealy, Fredericksburg, Corpus Christi, Kyle, New Braunfels, Spicewood, Schertz, Seguin, San Antonio, Houston, Fort Worth, San Marcos, Creedmoor, Point Venture, San Leanna, Sunset Valley, The Hills, Volente, Webberville, Oak Hill, Bluff Springs, Cele, Elroy, Kimbro, Littig, Lund, Irving, Laredo, Lubbock, McNeil.